Print2eforms is a reliable name in the field of XML conversion services. We can convert almost any format into XML within the prescribed turnaround times and in reasonable costs. With the confidence of processing millions of pages per year, the following benefits are just a tip of the iceberg. Data gets standardized for the representational purpose, thus improving the efficiency. Application information can quickly be sent to browsers or business applications. Web publishing becomes very convenient. Data access across applications becomes easy. This format is very flexible, useful for business to store and share information. The complex data structure can be simplified through this format. Non-technical people can make minor corrections as no programming is required. You can include multiple media such as images, videos. Output can be obtained in print, web or any other publishing systems. With respect to the XML conversion services, we are in the midst of what can be called as the information boom or explosion, and any information that is not published on the net is unfortunately considered as “not something worth sharing or even reading”. Every business worth its salt wants a decent position online for which it needs to ensure that information on their web pages, docs, pdfs and other document formats reaches and becomes popular among netizens. XML, an abbreviation of Extensible Markup Language is a format designed to hold the indefinite information manner. The preferred language for internet publishers, whether it is websites, blogs, off pages, etc. It is beneficial in sharing valuable information through the internet to different types of computers, various applications, many companies, businesses or organization without passing through any conversion process and also utilised for encoding documents and serialising the data. 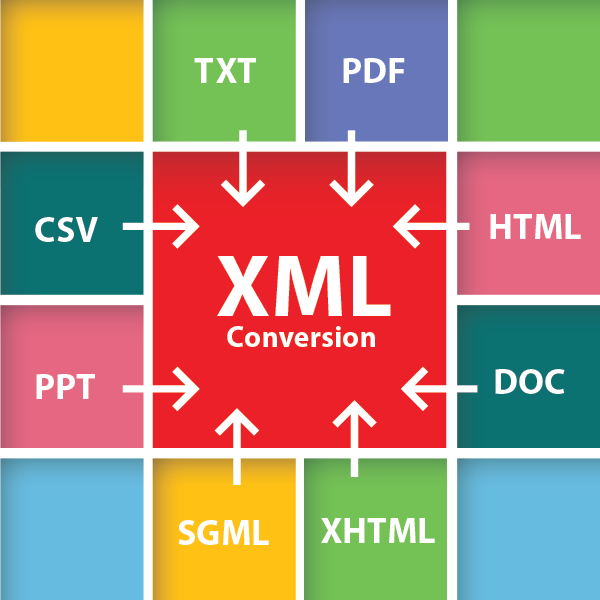 XML facilitates conversion from various formats like PDF, Word, HTML, Excel, etc. in a manner that is scalable, versatile, and flexible if compared to any other web-publishing format. Accuracy: We achieve quality standards that are above 99.99%, which is by far the best in Industry. Security: Documents are securely converted as we understand the importance that data will have in deciding the future of your organization. Cost: We offer very reasonable prices, we always work towards increasing the profitability of our client. Scalability: Few titles or millions of pages, we have solutions for all sizes. If you want to execute a large project in a short span, we are the best partner you can rely on. Contact us for XML conversion services and see the difference that it makes to your online content.